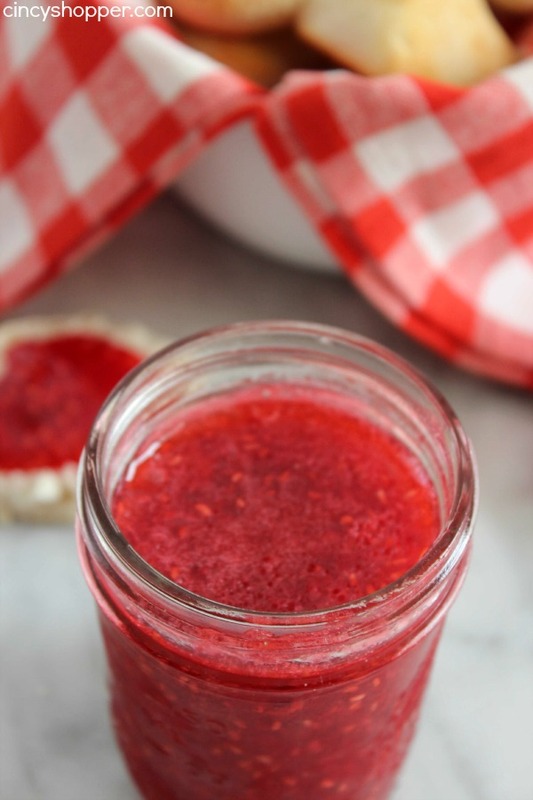 This No Cook Raspberry Freezer Jam Recipe is super simple. Perfect for toast, biscuits, pb&j sandwiches or just about anything that you enjoy topped with fruit. So much better than the store bought stuff loaded with preservatives. Last week, I scored a sweet $0.99 deal on Raspberries at Aldi. I was not quite sure what I was going to create with them. I just could not pass up the deal. I scored raspberries for $0.99 each the week before and made some SUPER Raspberry Strusel Muffins that were super delish for my evening desserts and also for our breakfast. After shopping, I began thinking of what other foods I really enjoyed with raspberries. Ding Ding Ding…Jam! I eat Peanut Butter and Jelly for lunch most days topped with some over priced store bought Raspberry preserves. While surfing Pinterest, I have come across MANY freezer jam recipes. Most of them required cooking. I like to keep things as simple as possible and cooking the fruit was really not necessary. 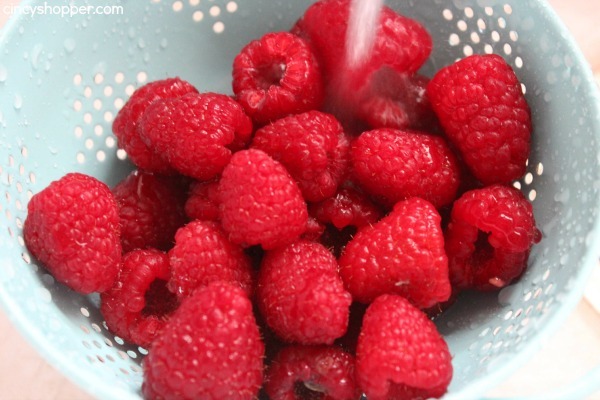 The flavors in my raspberries were very flavorful to begin with! So I was ready to make some NO Cook Freezer jam. This recipe is so simple. I think from this point forward, I will be making jam out of all the fruits that I purchase. We usually have some fruits that are “needing to be used” this recipe will be great for all of them. 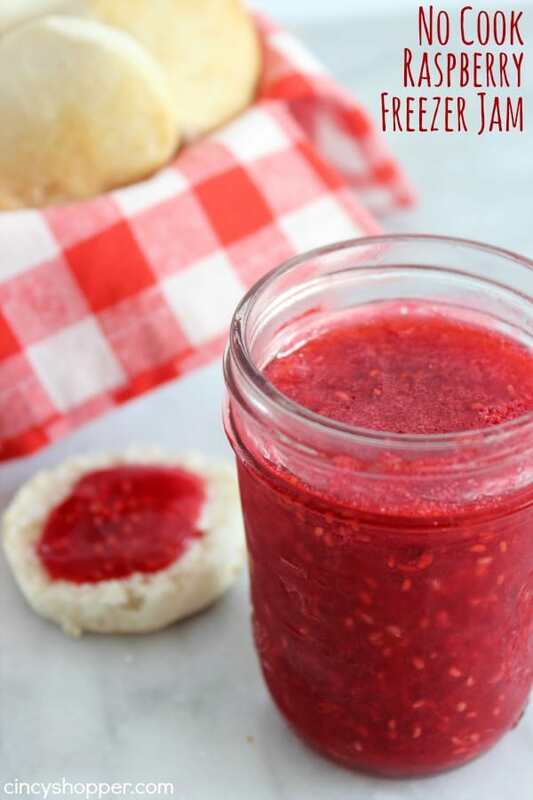 This quick and easy raspberry jam was so much better than the store bought. The flavors come through and really make for a tasty spread. 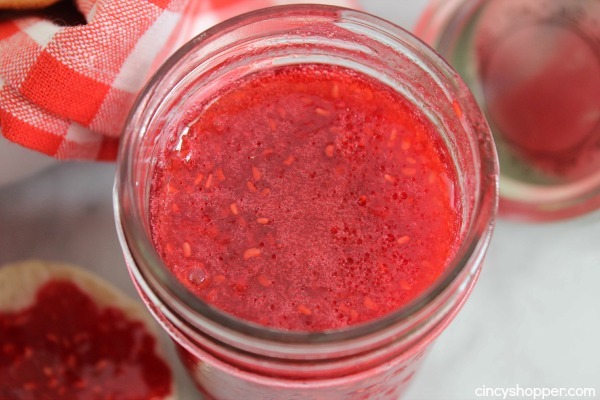 The ingredients for this No Cook Freezer Jam are so simple…just like the recipe. The only item you will most likely need to purchase will be the Pectin. It cost me about $2 at Kroger and can be found in a few different name brands. I decided to save a bit and purchase the store brand. This one box of Pectin will make quite a bit of freezer jam. Boil an 8 oz Mason jar, lid and ring to sterilize. Mash raspberries and verify that you have 2/3 cup. Add sugar and pectin and mix well to dissolve. If texture seems grainy, microwave for 30 seconds and continue stirring. Transfer mixture to mason jar place lid and screw on lid. Place in freezer until ready to use or in refrigerator if you will use now. 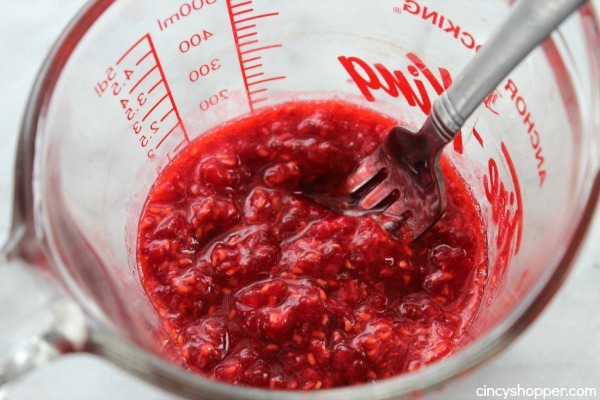 Your jam will thicken the longer it rests. I made the batch and enjoyed some almost immediately on my biscuits for breakfast and then again on my sandwich for lunch. I grabbed it from the fridge this morning to have on top of my toast and it was a a bit thicker. Later this evening, I plan to try a bit on my ice cream for after dinner dessert. YUM! 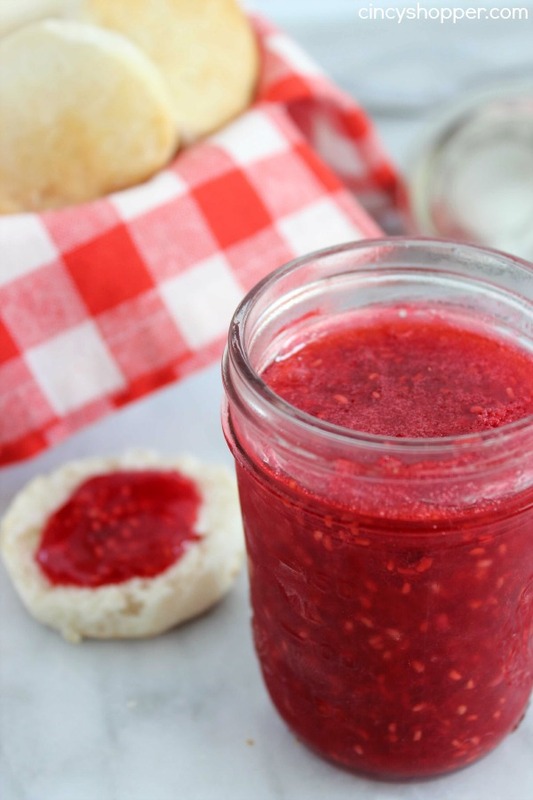 You can place your jam in the fridge for at least one week. I’ll freeze up a batch to enjoy later. 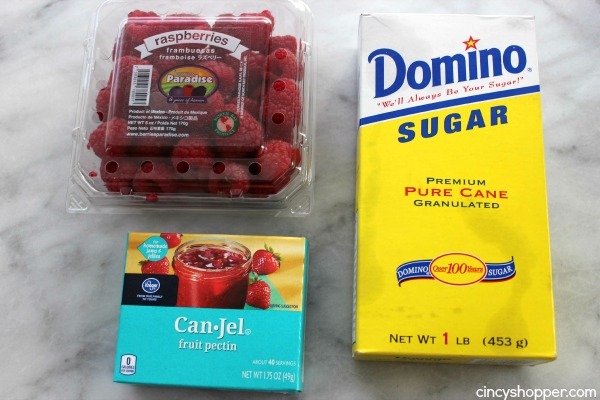 I’ve never made freezer jam before but this looks so easy! Going to have to try this! I like simple and this is perfect! I am going to have to make some with my summer fruits! Dropping in from Fluster Creative Muster! Thanks for the share! Pinned it! Looks so great and I love you put it in the freezer! Sounds so simple. Thank you for sharing on Merry Monday! Have a great week! 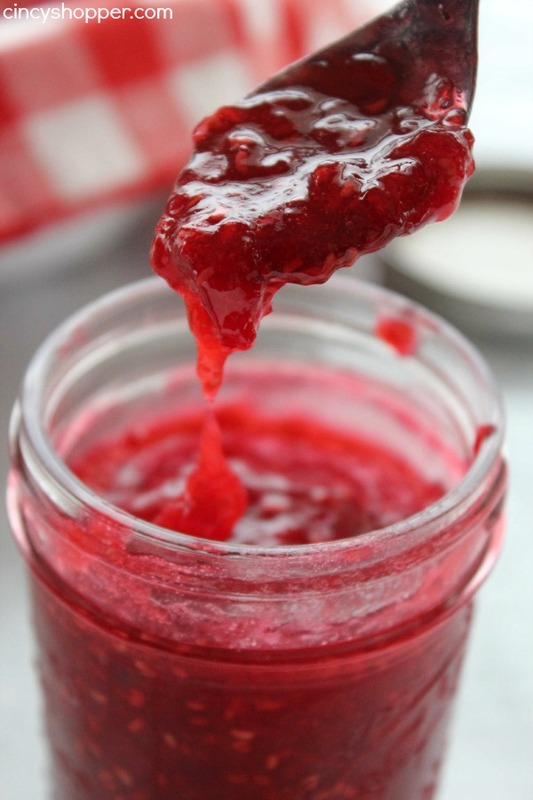 I love raspberry jam… and this year my little one will actually be old enough to help make it. I’m super excited! I think I might give your recipe a try this year… it looks simpler than the one I use. Thank you for sharing! May I use plastic freezer containers instead of jars?